Hundreds of demonstrators took the streets of Hanover on Saturday to protest against the anti-migrant, anti-Islam party 'Alternative for Germany' (AfD), as it held a congress to elect a new leadership. The AfD won 12.6 percent of the vote in a general election in September, becoming the third-biggest group in parliament with 92 seats and the first far-right party to enter the Bundestag since the 1950s. Some 600 of its delegates are gathering until Sunday to elect new a leadership and agree on a political roadmap they hope can turn the AfD into Germany’s main opposition party. The party has cheered Chancellor Angela Merkel’s slide in September’s election, in which her conservative party suffered its worst result in postwar history. Merkel has since been struggling to build a coalition government, plunging the country in its biggest political crisis in decades. The AfD party, which was founded in 2013 on an anti-euro platform, has steadily gained popular support in Germany, helped by growing angst over Merkel’s open-door refugee policy and a string of deadly Islamist militant attacks. Some of the AfD's electoral campaign posters read: "Burkas? We prefer bikinis." However, the AfD has itself been deeply divided between a radical wing and a more moderate one. The party’s co-founder and co-chair Frauke Petry, who had been regarded as a more moderate force in the party, resigned right after its electoral success in the September election. She argued the party had to break with hardliners if it hoped to be a constructive opposition force with potential to move into government. In an attempt to reconcile its rival factions, the AfD currently has a shared leadership with at least two co-chairs. Alongside current co-chair Jörg Meuthen, the moderate wing hopes to elect the head of AfD Berlin, Georg Pazderski, a former army colonel. But hardliners are hoping the party’s parliamentary group chief Alexander Gauland could mount a leadership challenge. Among the motions to be debated over the weekend are a call for Germany to ban circumcision of baby boys - targeting a practice among Muslim and Jewish families - and a call for a narrower definition of anti-Semitism than the one adopted by the German parliament, which the party says is a curb on free speech. Authorities expect around 8,000 people will gather in the northern city over the weekend to protest against the AfD’s far-right views. Thousands of police have been deployed to try to avoid the clashes that marred a previous party congress last April in Cologne, where several officers had been injured. 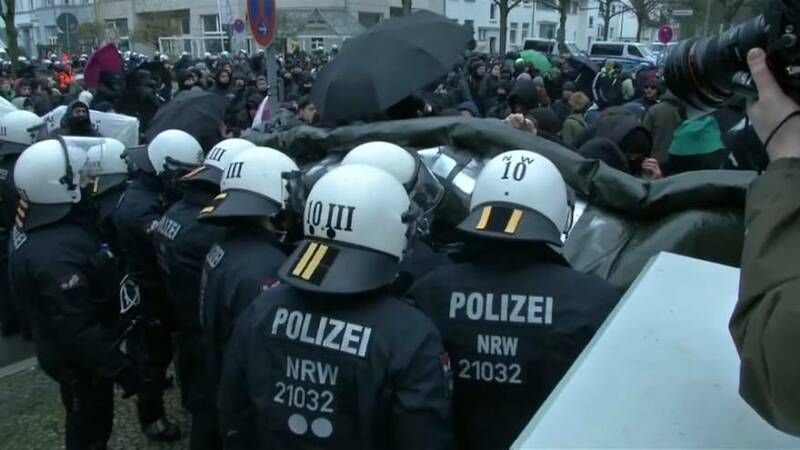 Demonstrators have already hindered access to the venue in Hanover, delaying the party meeting and prompting police to use water cannon - despite freezing temperatures - to disperse protesters blocking the streets.